The World Wide Web gives us access to a great variety of information on many different topics. When we want to use the information or resources we find on the Web for information or research purposes, we need to exercise some care to make sure they are authentic, reliable, and authoritative. We need to be equally cautious when we use information from other sources. Print sources that are available to us through a research or academic library have often been put through a screening process by professional librarians. There are several virtual libraries on the Web, and its useful to consult some of these when doing research. Information in such libraries is selected and evaluated before its listed. It pays to be skeptical or critical of the information we want to use. Its relatively easy to publish information on the Web, and information can be presented in such a way as to hide its intent or purpose. Generally, as we evaluate documents, we also learn more about the topic were considering. Citing references or writing a bibliography is usually part of creating a research report. You provide citations so others may check or examine the resources used in the report. There are several agreed-upon styles for citing documents in print format. When using resources from the Web or the Internet, it is necessary to have a uniform citation format. 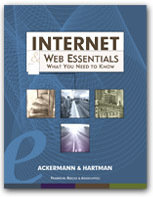 This chapter presents a set of formats for documenting or citing information obtained from the Web or the Internet. Citations to documents and other information found on the Web or Internet always include the URL, or Uniform Resource Locator. A URL includes the names of the Web server and the file or directory holding the information. The URL therefore tells you which Internet protocol to use to retrieve the information and where its located. You need to be precise in terms of spelling and capitalization when writing a URL, as a computer will be interpreting it. We listed URL formats for common Web or Internet services. There is no uniform agreement on how to cite information from the Web or Internet. Most styles suggest that a citation include the authors name, the works title, the date the information was last revised, the date the information was accessed, and the URL. The date of access is included because its relatively easy to modify information on the Web and the information may not always be the same as when it was accessed for research. We discussed methods for determining the date of access and the title of a Web document. Using bookmarks in Netscape Navigator is an excellent way to organize resources youve found on the Internet. They can be used to help manage citations.